Your comic has great characters that get into extra funny shenanigans. From cosplay, to candy dealing, to a crazy quiz bowl, to romance, to body issues, and insecurities. It has everything a twentysomething can relate to! I like how they all hang out and they feel like an honest friend group. There is some jealousy, anger, and sarcasm. There is plenty of love, laughs, and caring too! I really admire the way the group and their story is written. The characters are really something special. They all are designed in a mindful way with consideration of their personalities. I like how diverse all the characters are and how we are slowly getting to know each one! I think Ebba is my favorite. So cute and buff! I think obviously Barry and Renee need to be together. 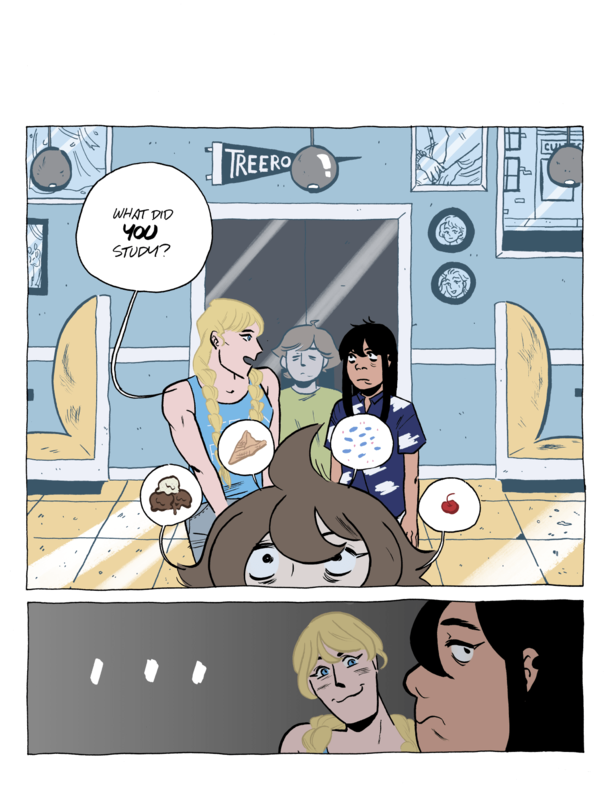 I love how Sylvia is obsessed with food. I really enjoy how Evelyn is just mean! I am excited to see the turn Treeroot is about to take. That is, it seems like we are about to drive deeper into these characters and their insecurities, starting with Evelyn. I’m excited! I can not wait to learn more. The art is amazing and the writing is awesome! You two make a great team! All Images Copyright Leo and Abby.